WASHINGTON There were all the trappings of a high-octane presidential debate: the over-the-top declarations, the pre-practiced zingers and the schmaltzy appeals to America's truest values. But the presidential candidates were nowhere to be found. In their place Saturday were two celebrity gabbers who have claimed their stakes to the polar opposite ends of the political spectrum: Bill O'Reilly and Jon Stewart. The political odd-couple came to Washington ready to tangle in an event mockingly dubbed "The Rumble in the Air-Conditioned Auditorium." Choice words not suitable for the faint of heart dotted the 90-minute exchange between the Fox News anchor and the star of Comedy Central's "The Daily Show," who bantered aggressively but good-naturedly over birth control, President George W. Bush and the so-called "War on Christmas." Stewart came prepped with a mechanical pedestal he used to elevate himself in the air, making the height-challenged comedian appear taller than the lanky O'Reilly when he wanted to drive a point home. "I like you much better that way," O'Reilly quipped at one point as he gazed up at his ideological foe. The political feud between the two caffeinated TV personalities dates back more than a decade. Much like family members who just can't resist pushing each other's buttons over Thanksgiving stuffing, Stewart and O'Reilly love to disagree, but appear to hold nothing against each other once the latest spat has run its course. The two have appeared on each other's programs since 2001, but the face-off Saturday at The George Washington University marked their first head-to-head debate. Appearing wholly presidential in dark jackets and face makeup under a sign reading "Yum, this banner tastes like freedom," the two quickly turned to talk of government spending and the 47 percent of Americans that Republican Mitt Romney said in a video are dependent on government. Stewart, defending government involvement in health care and social programs, said the U.S. has always been an entitlement nation. "We are a people that went to another country, saw other people on it and said, `Yea, we want that," Stewart said. "Have you ever seen `Oprah's favorite things' episode?" Asked who he'd like to see as president, O'Reilly dead-panned: "I'd have to say Clint Eastwood." "Well why don't we ask him," said Stewart, mocking the Hollywood actor's widely panned speech in August at the Republican National Convention by getting out of his chair and staring at it while the crowd erupted in laughter. 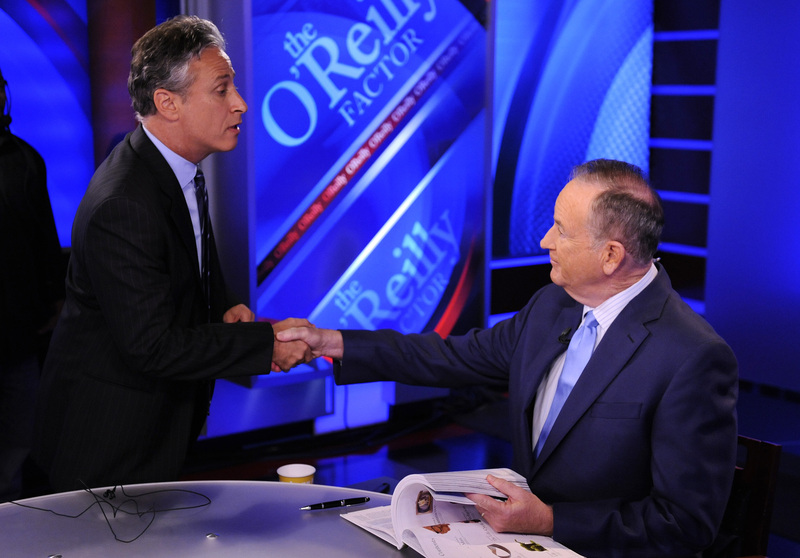 In an apparent show of bipartisanship, Stewart even got on O'Reilly lap at one point. "And what would you like for Christmas, little boy?" O'Reilly said slyly. "The display that you saw tonight is why America is America. Robust, creative, no holds barred," O'Reilly told reporters after the debate. "You can call it whatever you want, but you wouldn't see this in a lot of other countries. That's for sure." Organizers said about 1,500 people attended the event, but the main audience was intended to be online, where the event was live-streamed for $4.95. On Twitter, viewers complained they missed the event when the video servers crashed. Organizers said video will be available for download and that those who experienced errors will be eligible for a refund.